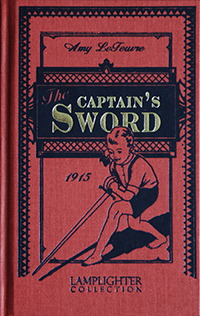 The Captain’s Sword is a delightful story about a brother and sister and the lessons they learn as they wait expectantly for the return of their dear daddy, the Captain. Amidst never-ending escapades, important lessons of obedience and faith help Tim and Mops to overcome stubbornness, pride, and fear. While Tim admires his dad’s shiny sword hanging on the wall, he soon learns that it’s the Captain’s other Sword that cuts on the inside to bring about real change! The Captain’s Sword is sure to be one of your favorite Lamplighter stories for children— another treasure by Amy Le Feuvre, author of the much-loved Teddy’s Button! From Anonymous of Stockbridge, Georgia on 3/24/2015 . This really is the best Lamplighter book out of the 50 plus that I've read. Can't wait to read it aloud to my children.